Today we have the pleasure of visiting with Niki from Original Country Girl. This interview is someone who is homesteading and learning country skills to be self sufficient. I hope after reading this, you will take the time to visit her blog. She hunts, spins wool, and gardens, so there are a variety of things to read about. 1. Tell us about your homestead farm? Our farm is in a rural northern WI town, where most of my neighbors are Amish! We're a smaller place, officially 6 acres, but with 65 additional leased acres around our 6. 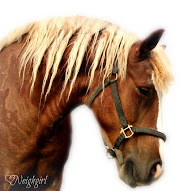 Well, there is my beloved "naughty horse" that I blog about occasionally. He's just too smart for his own good, and it makes for some interesting stories for sure. 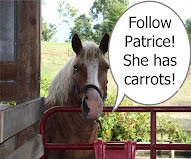 (Check out "Adventures of the naughty horse - the tale of bucketfoot" for an example.) 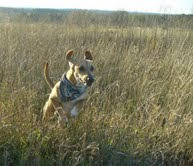 We also have my pup, who is my unofficial blog mascot. 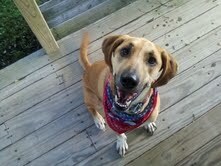 He's a Rhodesian Ridgeback X Redbone Coonhound cross, and he's 7 this November. 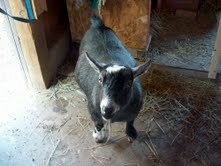 Then there are the goats, Buddy the pygmy, who's just a pet, and our dairy goats, which are Nigerian Dwarf goats. Right now we have zero fowl since we've finished butchering, but usually there are some Midget White turkeys, pheasants, and chickens. I haven't raised layers for the last couple of years but I'm planning to add a few in spring. 3.How do the animals get named? Usually by accident! Some, like Buddy, came to us with a name. Buddy was someone's pet, and we adopted him when they decided they didn't want him anymore. He's older so he's just a nice pet, and an excellent alarm system! No one and nothing comes on our land without Buddy alerting us to it. My dog came from a Pound, from a "Dukes of Hazzard" themed litter. There were 4 pups, Bo, Judd, Luke, and Daisy. We adopted Luke. We think that animal adoption and rescue is just so important! We've never regretted adopting our pup, he's been a fantastic dog. 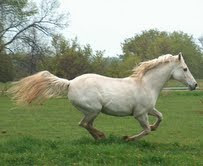 My naughty horse came to me named, since he's an Arabian. They are named through lineage, and he's a Khemosabi Arab, so he's named Kherome. We call him Key for short. 4. Tell us about your goal of self sufficiency? I like to feel that we can "take care of ourselves." We've been working for the last couple of years towards getting some Solar panels put in, but we don't get a whole lot of sun up here in the great white north, so it's not likely to ever be our only source of power. Because we live way up on the top of a hill, we're excellent candidates for wind power. It's something we're looking into, because we get plenty of wind! I have some concerns about wind power though, that we haven't quite resolved yet. While I don't ever anticipate being 100% off grid, we're working towards being less dependent on the grid. It's kind of a personal hobby/goal. 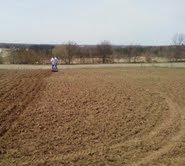 To further our self sufficiency goals, we raise a lot of our own food. We have a 2 acre garden, an apple orchard, a grape "vineyard" with 4 varieties, a plum orchard, a strawberry patch, blueberries, blackberries, and raspberries. Because I have serious concerns about how meat is raised these days, we buy almost no meat from stores. Commercial farming, and CAFOs, (concentrated animal feeding operations) just horrify me. I understand that animals are food, but we believe that they need to be raised in a humane way, and given a good life prior to being butchered. So we raise fowl, as I previously mentioned, which we butcher and put in our freezer for use throughout the year. We also, as a family project, raise 2 or 3 cows every other year. We keep half a cow, and our family members take halves or quarters for their own use. We are also avid hunters, so we usually have plenty of wild game in the freezer as well. All of the above! I love to cook, but I get thwarted in that quite a bit. My husband is a man of limited tastes! He likes the same basic staples, and isn't a big fan of trying new things. I actually recently blogged about this subject, specifically the time I made couscous. I like it, but for my hubby, well, it went over about as well as a lead balloon. I previously mentioned my garden, which takes up about 2 acres, maybe a bit more now since i expanded it a bit this year. I only grow heirloom, non-GMO, non-hybrid plants in the garden. I order most of my seeds from Landreth Seed Co, since they do not carry any GMO seeds, and only a tiny handful of hybrid plants. They've been serving American gardeners since 1784! Landreth also supports American jobs by doing all their catalog printing here in the US, even though that raises their costs significantly. That is important to me, because we are a Military family. I support companies that support American jobs. I can much of our garden produce each year. We usually have tons of apples, so I make applesauce, apple butter, apple pie filling, etc. I love pumpkins and squash, so I grow quite a bit of those, which I can as well. We make jelly from our grapes and plums, but most of our berries get eaten fresh. Who can resist fresh berries? There isn't much time left for hobbies after chores get done, but I do have a couple! I have a lovely 40 year old Ashford spinning wheel on which I spin various wools into yarn. Spinning is a great hobby, since it produces a useful end product. I knit with the yarns I make, and I sell some of the yarn to others who want handspun for their crafts. My other hobby would be shooting, both gun and archery. I especially love the challenge of archery, and I've been shooting for about 16 years. I guess you could say I am a "hobby" survivalist as well, since I love learning primitive skills. My husband likes to joke that I am his "Amazon" wife, since I am over 6' tall and love hunting, camping, and survival skills training. 7. What made you decide to blog? My main reason behind starting Original Country Girl, was to connect with other like-minded people. I love to meet fellow homesteaders and hear about what they are doing on their homesteads and farms. There doesn't seem to be too many of us left these days, so it's great to find others out there and share experiences. 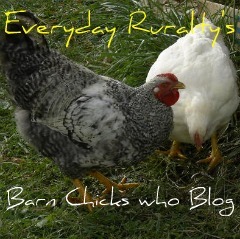 I love reading other homesteading blogs! 8. What are your goals for your blog? I just hope to be able to continue growing my readership, and to be able to share my love of farm life with others! 9. Do either you or your husband work off the farm? Oh yes, we both do. My husband is full time in the Military. He's my hero, and he's served the US for many years now, including 3 deployments for the current Iraq war. I also work outside of the home, but my job is not nearly so exciting. I work for the State in water quality, ensuring that our waters stay clean, and free of pollution for future generations. 10. Do you fish and hunt with your husband? 11. What's your favorite thing about living in the country? Oh, that's a tough one...what's not to love? I guess if I had to pick just one thing, it's the isolation. I love the quiet, and I love that at night, out here, it gets truly dark and the stars are just so bright and beautiful. I'm not a fan of noise or crowds, so the quiet, peaceful, isolation of country living is an amazing blessing to me. 12. What's in the future for your homestead? As I mentioned before, we're working towards trying to incorporate wind power into our homestead. That is a long term project for us. 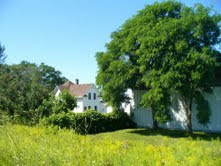 We are also in the process of purchasing 40 additional acres of land to expand our homestead further. I may work towards increasing my dairy herd as well, since I have a slight addiction to cheese ( ha ha)! I'm very interested in moving into some cheese making. Really my main goals are to continue what we're doing, and expand where possible. I'd like to see us providing 90% of our own food, and currently we're probably only providing 50 to 60% of our own food. 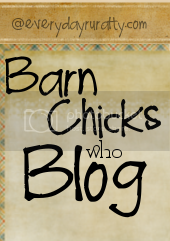 Niki- I wish you all the best with your homesteading venture and your blog! I would love to learn how to spin yarn! I saw a spinning wheel last weekend on the Spoon River Drive and almost bought it. 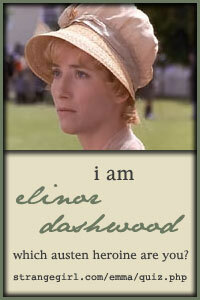 It is fun to read about other women and learn more about them. I loved the couscous comment and must go read her blog about it... my hubby's the same way. He has eaten the same thing for breakfast for over a year! He's a meat and potato kind of guy and the plainer, the better! great interview. she sounds like a great gal! Thanks for the interview Patrice! My kid's mom, used wheels are a great bargain, but always make sure the wheel is functional and complete! I bet there is a shop somewhere near you where you could get some preliminary lessons to get you started. Shops also often sell wheels that were used by their students, so you get a high quality used wheel at a discount! Dreaming, maybe our husbands were seperated at birth! LOL Mine is totally unimpressed by new cuisine. He just wants a slab of meat, some starch, and if forced, a small amount of veggies. Good Job Interviewing~! You asked just the right questions..